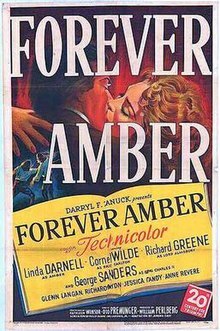 Forever Amber is a 1947 American romantic drama Technicolor film starring Linda Darnell and Cornel Wilde. It was based on the book of the same name by Kathleen Winsor. It also starred Richard Greene, George Sanders, Glenn Langan, Richard Haydn, and Jessica Tandy. The film was adapted by Jerome Cady, Philip Dunne and Ring Lardner, Jr., and directed by Otto Preminger, who replaced original director John M. Stahl after 39 days of filming and $300,000 of production. The movie was originally budgeted at $4.5 million. The Hays Office had condemned the novel, but within a month of its publication the movie rights had been purchased by 20th Century Fox. The film on its release was initially condemned by the National Legion of Decency. In 1947, Darnell won the starring role in the highly anticipated film adaptation when the original star, newcomer Peggy Cummins, proved too inexperienced for the role. The character Amber in the novel was so called because of her eye color. Publicity at the time compared the novel Forever Amber to Gone with the Wind. The search for the actress to portray Amber, a beauty who uses men to make her fortune in 17th-century England, was modeled on the extensive process that led to the casting of Vivien Leigh as Scarlett O'Hara. The film's score, by composer David Raksin, was nominated for the Academy Award for Original Music Score. The film begins in 1644 during the English Civil War, as we see a group of Roundheads pursuing a Cavalier's carriage. The carriage drives into the country where its passengers abandon a baby, named Amber, on the doorstep of a farming cottage. The roundheads soon catch up with the carriage and kill all the passengers while the farmers discover and decide to adopt Amber. The film moves forward to 1660; the death of Oliver Cromwell and the restoration of the Monarchy. The residents of London rejoice and celebrate the return of the monarchy, but the small rural towns and villages remain strictly puritanical. Sixteen years after being abandoned in a small rural village, Amber (Linda Darnell) has grown into a beauty and is about to be married despite her protests. She wants to be more than a farmer's wife and dreams of court fashions and a life away from the village. Her dream comes true with the arrival of a group of cavaliers and the handsome Bruce Carlton (Cornel Wilde), with whom she becomes instantly smitten. She follows the Cavaliers to a tavern and begs Bruce to let her come with him to London. Despite her request and coaxing from Bruce's friend Almsbury (Richard Greene), Bruce refuses her, while Almsbury also unsuccessfully tries to seduce her. Amber once again tries to convince Bruce to take her to London, which he refuses, before they share a kiss. Bruce and Almsbury return to London to seek an audience with the king but are turned away. Barbara Villiers, the king's mistress, is brought to court and coldly walks past them. As Bruce and Almsbury return to their London tavern, they see that Amber has followed them to London. Bruce allows her to stay with him and they begin an affair whereby Bruce pampers Amber with new gowns and takes her to the theater. At one performance, Bruce sees Barbara Villiers (Natalie Draper) alone and goes to speak with her about getting the king to grant him ships for his privateer mission. Amber is distraught at the thought of Bruce leaving and stops Almsbury from warning Bruce that the king has arrived. The king sees Bruce with his mistress and later summons him to court. Not wanting his friend to face the king's wrath alone, Almsbury goes with him. The king, however, grants Bruce the ships he needs and requests that he leave for Bristol that very night. Bruce and Almsbury return to the tavern to see Amber sleeping. Bruce plans on leaving before Amber wakes, and Almsbury helps him pack, despite telling Bruce that Amber loves him and it would be cruel. The next morning Amber wakes up to find Almsbury packing up his belongings and returning to Almsbury Hall. Almsbury explains that the king gave him back his lands and gave Bruce his ships as Amber races into Bruce's room to see it empty. Almsbury tries to convince Amber to go back to her village but she refuses, stating that she will marry Bruce no matter what. Almsbury leaves her and gives her money from Bruce to keep her from starving. However Amber is quickly conned out of her money, put in debt and sent to Newgate Prison. While in Newgate Prison, Amber discovers she's pregnant with Bruce's child and meets Black Jack Mallet, a highwayman, who falls in love with her and who helps her break out. The pair go to Mother Redcap's (Anne Revere) tavern where Amber gives birth to a son. Amber soon begins to make a living luring fops into alleyways where Black Jack robs them. During one of the robberies, Black Jack is killed by the king's guard and Amber flees. She hides inside a house where she is discovered by Captain Rex Morgan (Glenn Langan). Captain Morgan gets her work as an actress to save her from being sent to Tyburn and takes her as his mistress. While Amber is working as an actress, the Earl of Radcliffe shows an interest in Amber, and Almsbury returns to London. He is now married with a child and tells Amber that Bruce will return any day now. Captain Morgan also proposes to Amber but she rejects him because she still loves Bruce. She also turns down a chance to dine with Charles II because of Bruce. Bruce returns and Amber introduces him to their son, hoping he will want to settle down. However he wants to return to sea. Morgan finds Bruce and Amber together and challenges Bruce to a duel, saying Amber is his fiance. Bruce accepts though he tries to persuade Morgan to end the duel. Morgan refuses and Bruce winds up killing him. He blames Amber and rejects her, and leaves England. Amber decides to marry the elderly widowed Earl of Radcliffe. This will make her a countess, which she hopes will interest Bruce. She discovered that Bruce's ship has docked in London and he has fallen victim to the Black Plague. She saves his life by killing a nurse and lancing a boil on his chest. Bruce recovers and after discovering Amber is married to Radcliffe, leaves Amber for Virginia. A great fire hits London. Charles II attempts to seduce Amber, but Radcliffe takes her home and locks her up in her room. The fire reaches their house, Amber fights with Radcliffe. A servant hits Radcliff and throws him into the fire, killing him. Amber becomes Charles' mistress. Bruce visits from Virginia with his new wife Corinna, wanting to take their son to America. Amber invites Corinna to dine with her and Charles II, hoping Charles will seduce her. Charles figures this out and allows Corinna to leave. Charles then ends his relationship with Amber, realising that she still loves Bruce. Bruce asks again for custody of his son. Amber asks the son to decide, expecting him to want to stay with his mother. However the son is keen to go to Virginia. Bruce offers Amber the chance to come with them but she decides to stay. Amber watches heartbroken as Bruce takes her son away. It was based on the debut novel by Kathleen Winsor which she had written over five years. Macmillan, who had published Gone with the Wind, were excited about the book's commercial possibilities and launched it with in initial run of 175,000 copies. The New York Times called Winsor a "born storyteller". The same paper called the book "one of the most expertly packaged bundles of literature in years". It became a best seller. The book was banned in a number of countries including Australia. There was film interest in the book from the moment it reached the publisher. Winsor's agent suggested she not enter a competition MGM were running for novels because the agent felt they could get more than the prize money offered of $125,000. In November 1944, 20th Century Fox bought the screen rights for $200,000, one of the highest ever amounts paid for a novel. This money was contingent on Hays Office approval of a screen treatment of the book. (By way of comparison, Edna Ferber received $175,000 for Saratoga Trunk; MGM paid $125,000 for Green Dolphin Street and $200,000 to A.J. Cronin for The Green Years; Ernest Hemingway got $150,000 for For Whom the Bell Tolls." The following month Winsor announced she had signed a contract with Fox to work on the script for the film, provide technical advice, and do a screen test. Jerome Cady was going to write the script and William Perlberg would produce. Cady finished the script by March. Eventually Philip Dunne did the script and John Stahl was assigned to direct. Dunne was one of the studio's top screenwriters and Stahl had just made the hugely popular Leave Her to Heaven for Fox. Dunne later called the novel "worthless" and believed in any adaptation "it would be foolish to try to recover the intent of the author which is to please that part of the public that likes to lick its lips while reading." The script had to make a number of changes to get past the censor. "We had to be more straight aced with Amber than we would with another picture," said Perlberg. ""Everyone is waiting for a chance to jump on us." Amber's lovers were reduced from over 30 in the novel to five in the film. Winsor had little involvement in the script and the film in the end. There was an extensive, well publicised talent search for whole would play the lead role along the lines of the one David O. Selznick did for Scarlett O'Hara. In November 1944 Gene Tierney was reported as being the front runner. Maureen O'Hara who was a redhead and under contract to Fox, lobbied hard for the role, even wearing a period dress in the studio commissary. Paulette Goddard also wanted to do the part. Numerous actresses were tested. Perlberg said he was looking for "a young Vivien Leigh" or "an English Lana Turner." Peggy Cummins, an English actor who had been on stage in Junior Miss, was (reportedly) the 37th tested and soon established herself as a favourite in October 1945. Annette Simmonds was also a front runner. Richard Green, a Fox contract player who had not worked in Hollywood since 1940 due to war service, was an early favourite for the role of Bruce Carlton. James Mason, then starring in the hugely popular The Seventh Veil, was offered the role but turned it down because he thought it was "a silly book" and the "script didn't improve it". The first actors announced for the film were Reginald Gardiner who was cast Charles II by December 1945 and Glenn Langan who was cast by January 1946. In February 1946 Daryl Zanuck of Fox said the lead would be played by Peggy Cummins, with Cornel Wilde (a studio contract star) to play her main love interest. Wilde was, after Tyrone Power, the leading "swashbuckling" style star under contract to Fox at the time. Richard Greene was the other leading contender for the part, and Wilde was under suspension at Fox to a dispute over roles, but Zanuck decided on Wilde, and the suspension was lifted. Vincent Price was cast in a support role as Lord Almsbury, friend of Bruce Carleton. Filming started in March 1946. The budget was $3 million, making it the most expensive film in the history of Fox. (The previous had been Wilson.) The film was expected to take 103 days of filming and Cummins had to appear in every scene but one. Winsor was paid $85,000 when filming started. Cummins collapsed on set on March 30 due to illness. Filming was halted two times, reportedly due to illness on Cummins' part. Then on April 30, after 39 days of filming and $1 million had been spent, Fox announced that the shoot would be halted for three months and that Cummins and Stahl would be assigned to other projects. Zanuck, head of Fox, said the film "has failed to measure up to the standards planned." The reason given later was that it was felt Cummins was very good as the young Amber - she had been extensively tested for these scenes - but looked too young for play Amber as she grew up. In the words of the New York Times "they found that Miss Cummins as grown up seductress looked more like Fluffy wearing her mother's old clothes and smearing on mom's lipstick when she wasn't looking." Fox did not give up on Cummins and put her into The Late George Apley, Moss Rose and Escape. However, she would leave the studio after three years. In June 1946 Fox announced that Otto Preminger would take over from Stahl as director, and that the film would resume production in September. Preminger said he would use the same script as Stahl (which the censor had approved). It was estimated that if none of the Stahl-Cummins footage could be used, it would cost the studio $300,000. Preminger said the film had been stopped because "somehow all the elements didn't jell". He later said in his memoirs that he did not want to make the film because he disliked the novel but Zanuck forced him under his contract. He supervised a rewrite of the script by Dunne and Ring Lardner Jnr. Dunne later recalled he and Lardner "both had great distaste for the material... We divided it up because the steam was on... They wanted to get it restarted as soon as possible." In July, Linda Darnell was announced as Cummins' replacement. "I'm pinching myself," said Darnell. Preminger later said that he did not want Darnell, and would have preferred someone like Lana Turner who he felt could have been borrowed from MGM. However he says Zanuck wanted Darnell. Darnell's casting meant she had to miss out on a role in Captain from Castile; she was replaced by Jean Peters. By now the budget was up to $4.5 million. $2 million went on physical production. Because mostly contract actors were used, the cast only cost $350,000 (sets cost $380,000). There were other cast changes. Richard Greene (making his first Hollywood film in seven years) replaced Vincent Price. 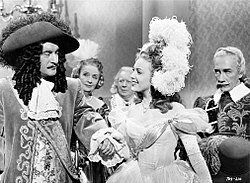 George Sanders replayed Reginald Gardiner as Charles II. John Russell, who the studio was grooming for stardom, was cast as Black Jack Russell. Wilde was reluctant to return to the film. Fox considered replacing him with Stewart Granger, though this would have been difficult due to Granger's other commitments. In October, right before filming was to resume, Wilde announced he would not return to the role unless he was given an increase in salary. He was being paid $3,000 a week for forty weeks a year but wanted an arrangement comparable to Betty Grable, who⟨ made two films a year at $150,000 a film. Wilde said "My agent said that since I am leading the whole Fox lot in fan mail I should be getting money comparable to that received by the top people at the studio. I am worth much more to the company than I was a year ago [when his contract was renegotiated] and an actor must insure himself against the time when he is no longer wanted." The dispute was ended when the studio increased his salary to $5,000 a week. Filming resumed in October 1946 and ended on March 1947. The budget by the end was $6.5 million. George Sanders was filming a part in The Ghost and Mrs Muir at the same time. The film was completed and released in New York in October 1947. The film played 451 dates in its first week and Fox claimed that it had achieved the biggest box office [opening] figures in the entire industry. Variety reported that it was by far the greatest amount of money racked up by one picture first week since they had been tabulating grosses across the country in 1946. In the 17 theatres they received reports from, they claimed it had grossed slightly better than $700,000. The film played with increased admission prices compared to most films. It set a house record at the Roxy in New York ($180,589). In the following week, Variety's reporting had 27 theatres playing the movie which in total grossed close to $800,000 taking its gross to $1.5 million in two weeks. The film was condemned by Cardinal Spellman and the Legion of Decency who threatened a boycott of Catholic theatregoers. Fox originally decided to fight the ban claiming the ruling was "harsh" and "unfair" considering all the effort they put in to get the movie past the censors. The studio changed its mind. A number of changes were made to the film, including adding a prologue which criticised Amber, saying, "the wages of sin is death" and adding an epilogue where Cornel Wilde says "may God have mercy on both of us for our sins." The film was re-released in December 1947. In 1986 there was talk that Raquel Welch would appear in a TV mini series version of the novel. However the mini series never resulted. McGilligan, Patrick (1986). Backstory: Interviews with Screenwriters of Hollywood's Golden Age. University of California Press. ^ Aubrey Solomon (2002). Twentieth Century-Fox: A Corporate and Financial History. Rowman & Littlefield. p. 212. ISBN 978-0-8108-4244-1. ^ "Forever Amber". Turner Classic Movies. Retrieved March 15, 2016. ^ 'Forever Amber' or 'Crime Doesn't Pay': In the Hollywood version the moral lesson will be underscored; Amber will suffer for her sins. By Frank S. Nugent. New York Times (1923-Current file) [New York, N.Y] August 4, 1946: 93. ^ Leff, Leonard J.; Simmons, Jerold L. (2001). The Dame in the Kimono: Hollywood, Censorship, and the Production Code (Second ed.). University Press of Kentucky. pp. 204–5. Retrieved April 3, 2017. ^ "The 20th Academy Awards (1948) Nominees and Winners". oscars.org. Archived from the original on July 6, 2011. Retrieved August 18, 2011. ^ Books -- Authors New York Times September 18, 1944: 17. ^ THE LITERARY SPOTLIGHT Butcher, Fanny. Chicago Daily Tribune October 8, 1944: E15. ^ Jumbo Romance of Restoration London: FOREVER AMBER. By Kathleen Winsor. 972 pp. New York: The Macmillan Company. $3. By WILLIAM DU BOIS. New York Times October 15, 1944: BR7. ^ Books of the Times By ORVILLE PRESCOTT. New York Times October 16, 1944: 17. ^ The Best Selling Books, Here and Elsewhere New York Times December 10, 1944: BR26. ^ "Australia Bans 'Forever Amber", New York Times, August 1, 1945: 17. ^ "Books and Authors", New York Times, October 8, 1944: 134. ^ "Of Local Origin", New York Times, November 3, 1944: 26. ^ By Way of Report By A. H. Weiler New York Times November 12, 1944: X3. ^ "Screen News: Kathleen Winsor to Act, Write, Advise at Fox Special to The New York Times". New York Times, December 13, 1944: 29. ^ "Brazil's Air Melting Pot Inspires Cinema", Schallert, Edwin. Los Angeles Times (1923-1995); Los Angeles, Calif. [Los Angeles, Calif], March 22, 1945: A3. ^ a b AMBER' IN HOLLYWOOD: Expensive "Sailor" NOTED IN HOLLYWOOD Cheering Section By FRED STANLEY. New York Times March 10, 1946: X1. ^ a b c d "'Forever Amber' or 'Crime Doesn't Pay': In the Hollywood version the moral lesson will be underscored; Amber will suffer for her sins", By Frank S. Nugent. New York Times, August 4, 1946: 93. ^ a b AMBER' IN HOLLYWOOD: NOTED IN HOLLYWOOD Yes and No The Pay-Off By THOMAS F. BRADY. New York Times November 3, 1946: 65. ^ Hedda Hopper LOOKING AT HOLLYWOOD Los Angeles Times November 29, 1944: 11. ^ "FILMS A change for Maureen O'Hara". The World's News (2755). New South Wales, Australia. October 9, 1954. p. 27. Retrieved December 15, 2018 – via National Library of Australia. ^ "O'Hara's strip-tease bid for "hussy Amber" role". The Sun (2210). New South Wales, Australia. August 19, 1945. p. 3 (SUPPLEMENT TO THE WEEK END MAGAZINE). Retrieved December 15, 2018 – via National Library of Australia. ^ a b "FILM CABLE FROM HOLLYWOOD". Sunday Times (Perth) (2501). Western Australia. January 27, 1946. p. 13 (The Sunday Times MAGAZINE). Retrieved December 15, 2018 – via National Library of Australia. ^ NEW FACES IN HOLLYWOOD: Meeting Postponed Searching for "Amber" MEMOS FROM HOLLYWOOD Murder on Ice No Author's Royalties By FRED STANLEY. New York Times October 28, 1945: X1. ^ "Film Stars in the News-- A "Sun" Thursday Feature". The Sun (11, 151). New South Wales, Australia. October 18, 1945. p. 9 (LATE FINAL EXTRA). Retrieved December 15, 2018 – via National Library of Australia. ^ Hedda Hopper LOOKING AT HOLLYWOOD Los Angeles Times November 17, 1945: A5. ^ The Peak of Popularity: The Public's Favourite Film Stars of 1945 E. W. Picture Show; London Vol. 50, Iss. 1232, (February 9, 1946): 13. ^ "Two Stars May Quit". The Sun (11222). New South Wales, Australia. January 10, 1946. p. 11 (LATE FINAL EXTRA). Retrieved December 15, 2018 – via National Library of Australia. ^ TYRONE POWER SET FOR RETURN TO FOX: Abort to Be Discharged From Marines, He Signs Contract to Do Two Films a Year Of Local Origin Special to THE NEW YORK TIMES. New York Times December 18, 1945: 23. ^ "TODAY: Movie news". The Daily Telegraph. VII, (10). New South Wales, Australia. January 20, 1946. p. 33. Retrieved December 15, 2018 – via National Library of Australia. ^ Amber' Leads Set With Wilde Cast as Carlton Schallert, Edwin. Los Angeles Times February 1, 1946: 9. ^ 'Amber' Peggy Cummins Hailed as Stellar Find: Irish Newcomer Described as 'Phenomenon' Schallert, Edwin. Los Angeles Times February 17, 1946: B1. ^ 'Amber' Leads Set With Wilde Cast as Carlton. Schallert, Edwin. Los Angeles Times February 1, 1946: 9. ^ VINCENT PRICE GETS 'AMBER' FILM ROLE: Will Depict Almsbury in Fox Version of Winsor Novel-- 'Road to Utopia' Opens Of Local Origin New York Times February 27, 1946: 31. ^ RETURN OF A LANCER. New York Times February 3, 1946: X3. ^ Looking at Hollywood Hopper, Hedda. Chicago Daily Tribune March 16, 1946: 17. ^ 'Amber' Stricken Chicago Daily Tribune March 31, 1946: 21. ^ FOX AGAIN HALTS 'FOREVER AMBER': Stahl Will Not Continue as the Director--Peggy Cummins' Title Role Part Indefinite New York Times May 1, 1946: 39. ^ 'Forever Amber' Film Production Is Halted; Cast Changes Impend Chicago Daily Tribune May 2, 1946: 29. ^ ZANUCK EXPLAINS 'AMBER': Fox Executive Says Lowering of Quality Caused Film Halt. New York Times May 2, 1946: 27. ^ THE UP AND COMING PEGGY CUMMINS: Or a Resume of Her Rise From 'Forever Amber' To the Present By BARBARA BERCH. New York Times July 13, 1947: 51. ^ Of Local Origin New York Times May 20, 1946: 19. ^ CUMMINS GOING: An Actress Softly Bids Good-by to Hollywood. New York Times August 1, 1948: X4. ^ PREMINGER NAMED TO DIRECT 'AMBER': Replaces Stahl as Fox Is Set to Resume Making Film-- Three Premieres Today Of Local Origin. Special to THE NEW YORK TIMES. New York Times June 14, 1946: 17. ^ Red Light Faces 'Amber' at Studio The Washington Post May 2, 1946: 10. ^ BY WAY: Gags: In the Film and On the Set By A.H. WEILER. New York Times July 14, 1946: 43. ^ FOX GIVES 'AMBER' TO LINDA DARNELL: Production Halt in Winsor Film to Find Successor to Peggy Cummins Cost $300,000 Special to THE NEW YORK TIMES. New York Times July 25, 1946: 17. ^ Choice of Linda Darnell as Amber Wins Acclaim: Director Promises to Retain Realism of Story Within Bounds of Good Taste Schallert, Edwin. Los Angeles Times August 4, 1946: C1. ^ Greene Will Return as Almsbury in 'Amber' Schallert, Edwin. Los Angeles Times July 27, 1946: A5. ^ STUNT FLIER TO DO PARAMOUNT FILM: Paul Mantz, Winner of Bendix Air Race, in Deal on 'Blaze of Noon,' Based on Novel Of Local Origin New York Times September 3, 1946: 27. ^ The Scooper Scooped! Hopper, Hedda. The Washington Post July 8, 1946: 5. ^ Wilde Will 'Stay Put;' Faith Bacon Plans Film Schallert, Edwin. Los Angeles Times (1923-1995); Los Angeles, Calif. [Los Angeles, Calif]September 26, 1946: 9. ^ Fox's 'Forever Amber' in Trouble Again As Cornel Wilde Holds Out for Salary New York Times October 16, 1946: 35. ^ Press Women's Group Will Discuss Service Thru Written Word Chicago Daily Tribune October 18, 1946: 24. ^ 'Amber' Now Causing Stir Los Angeles Times October 20, 1947: A2. ^ London 'Break' Brings New Beauty to Cinema Schallert, Edwin. Los Angeles Times (1923-1995); Los Angeles, Calif. [Los Angeles, Calif]January 25, 1947: A5. ^ WARMS TO FILM 'CLEOPATRA ARMS': Studio Buys Everett Freeman Story as Vehicle for Dennis Morgan, Lauren Bacall By THOMAS F. BRADYSpecial to THE NEW YORK TIMES. New York Times (1923-Current file); New York, N.Y. [New York, N.Y]October 22, 1947: 36. ^ PERLBERG SAYS FOX WON'T CHANGE 'AMBER' Special to THE NEW YORK TIMES. New York Times October 24, 1947: 19. ^ FOREVER AMBER' REVISED BY STUDIO: Skouras, Fox President, Says 'Public Opinion' Influenced Decision to Alter Film New York Times December 5, 1947: 33. ^ Blades, John (April 25, 1986). "AMBER` WRITER CAN STILL MAKE THE POT BOIL". Chicago Tribune. ^ ROCKIN' RAQUEL WELCH IS READY FOR THE ROAD: [SPORTS FINAL, C Edition] Beck, Marilyn. Chicago Tribune December 19, 1985: 13. Wikimedia Commons has media related to Forever Amber.